Great tragedies are supposed to have name. The Titanic, the Lusitania… Their dead live forever in the stories we tell about them and the living fight for change in their memory that they might not die in vain. This is just a boat of ‘migrants’ that sunk in the Aegean, another number, another regrettable spat of collateral damage in the border war. But not to us, the ones who were there when the rescued came into harbour. Not to me. Last night was the most traumatic of my life. Back home, I spoke with confidence about how ‘borders kill’ – but now I’ve seen it with my own eyes and I will never forget the sinking of that nameless ship. Tectonic Plates Or Losers’ Blues? ‘Tectonic plates…the slow subterranean shifting’: eventually the lava bubbles up from underneath and structures that seemed immutable come crashing down. Local government made our cities the great places they are today: water and sanitation, street works, street lighting, police and criminal justice, social services, parks, libraries, schools, birth marriage and death registration, coroners, theatres, concert halls and leisure facilities. Local government is what makes your city a civilised, enlightened place to live. We have started to take it for granted, and now these much maligned organisations are being cut to the bone for austerity, its structures sold off for profit. Civilisation is slowly being taken away. Never forget the lessons of history! This month marks the anniversary of a completely new system of local elections being implemented throughout England and Wales. 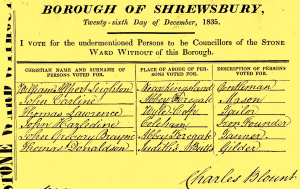 One hundred and eighty years ago, almost 180 boroughs in England and Wales began to publish the lists of all those eligible to vote in the new town council elections created by the 1835 Municipal Reform Act. Barely three weeks after the Act’s passage, specially appointed revising barristers started setting up registration courts to decide who would be able to vote in what initally looked like being a remarkably democratic franchise. Unlike the parliamentary household vote – only given to those occupying property worth at least £10 a year in rental value – the new municipal franchise had no minimum property requirement. In theory every male householder, no matter how humble his dwelling, would be able to take part.